State Certified Residential Real Estate Appraiser Specializing in the Appraisal of Residential properties, Camps, Land and Farms. Areas covered: Clarion Co, Forest Co, Jefferson Co, Venango Co, Northern Armstrong County and Northern Butler County. SMATHERS REAL ESTATE, INC, like many other providers of financial services, is now required by the Gramm-Leach-Bliley (GLB) Act to inform customers of our policies regarding the collection of nonpublic personal information during the appraisal process. The Federal Trade Commission (FTC) has ruled that appraisers are now considered to be financial institutions. This stems, in part, from longstanding statements by Intra-Agency Federal Financial Regulators, FannieMae, FreddieMac, and FHA that appraisers are considered as part of the financial institution for their participation in the lending process. State Licensed / Certified Appraisers have been and continue to be bound by the Uniform Standards of Professional Appraisal Practice, (USPAP) and the Ethics Rule which consists of the conduct, management, confidentiality, and record keeping sections. These rules and standards are more stringent than those required by law or regulation. SMATHERS REAL ESTATE, INC. has always been diligent about protecting information deemed to be private or confidential in nature. Nonpublic and personal information about you and your property is collected during the course of developing and completing the appraisal process. This is generally accomplished with your knowledge and approval. Nonpublic information is normally provided to our company by you or obtained by us with your authorization. The purpose of the appraisal process is to develop a credible value opinion for the client or customer. A credible assignment result is part of the requirement for successful completion of a particular real estate financial transaction or business decision. This company does not disclose any nonpublic personal information obtained during the course of developing a property's specific value opinion except as required by law or at the direction of the client to assist in the completion of a particular financial transaction. Such nonpublic information may be disclosed to the client and any identified intended users of the specific appraisal, review, or appraisal consulting assignment. A fiduciary agreement is automatically in effect between our company and the identified client or customer and intended users per the Ethics Rule contained within the USPAP. Additionally, in all such situations, the appraiser must comply with all pertinent laws, rules, and regulations regarding the safeguarding of the analyses, conclusions, survey results, adjustments, and opinions relative to the appraisal process relative to this specific assignment. Our agency retains work records relating to the informational services that we provide so that we are better able to assist with your professional needs and to comply with the requirements of the Ethics Rule as contained within the USPAP. In order to secure your nonpublic personal information, our agency maintains physical, electronic, and procedural safeguards to comply with our professional standards of practice and provisions of the GLB Act. Clients / customers have the right to limit the reuse of their nonpublic personal information gathered during the course of the appraisal development process. The customer must notify this agency within a reasonable time (considered to be 30 days by the FTC) that public disclosure, or reuse of such information is prohibited except as required by applicable law, regulation, or the appraiser's Uniform Standards of Professional Appraisal Practice (USPAP). Please feel free to call if you have any questions concerning this policy. Your privacy, our professional ethics, and the ability to provide you with a quality product or service are very important to us. 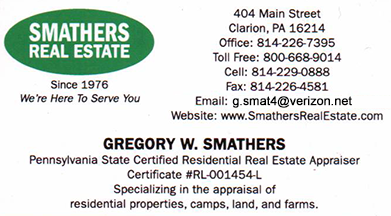 ©2009 Smathers Real Estate, Inc.